Not long after she left office, Thatcher wrote a memoir, which I reviewed in 1993 for Willamette Week. As I reflected on the praise for Thatcher throbbing over the airwaves, I saw a clear line of descent between her devotion to the “marketplace” and the recent collapse of the world economy. In both the UK and the USA, the gap between rich and poor has steadily widened over the last three decades. The politics of conviction attached to absolutist principles lead to the kind of intransigence that fuels the ideologically deranged Tea Party, whose adherents, like Thatcher, despise compromise. We’re living with the consequences of this form of anti-politics dominating the legislative process. Nothing happens, and in the long run, the consequences descend on the people least able to resist their effects. And the British version of Reaganism is Thatcherism, which led one wag to propose that instead of spending $15,000,000 on her state funeral, the British government should privitize it–as, say, the “Margaret Thatcher Memorial Service Brought to You by British Airways”©. It’s worth noting, too, that the decline in the golf industry parallels the shift away from income equality in the US. Like the false prosperity of the real estate bubble and the toxic derivatives associated with it, the short-term boom in golf development from 1994 to 2007 disguised a deeper trend–the long-term decline in the number of golfers and the number of rounds played, which peaked in 1999. The number of golfers in the USA has dropped by another 13% just over the last five years. The National Golf Foundation has reported that the net number of American courses has declined by about 150 annually over the last five years. Golf participation rates surged in the USA from the end of WWII into the 80s, as the middle class grew and working people had not only more money to spend but leisure time to enjoy. The Reagan reforms reversed that trend, with ironic consequences for the golf industry, whose leaders (and the top touring professionals, who in a straw poll three years ago overwhelmingly said they’d vote for Sarah Palin over Barack Obama) tend to echo the political thoughts, such as they are, of John Boehner. I am happy that Boehner, like Obama, plays golf, but I wish he’d concede a political putt once in a while. Margaret Thatcher, The Downing Street Years. HarperCollins, NY, 1993. Tory Prime Ministers did not merely dominate British politics in the 20th century, they also set a high literary standard. Winston Churchill, described by one of his successors, Harold Macmillan, as “the greatest Englishman of all time,” stocked the language with memorable phrases, both as statesman and historian. Churchill’s metaphor of the Iron Curtain—an image of ferric inflexibility the Soviets tried to parry a generation later when they labeled Mrs. Thatcher the Iron Lady, proving the Marxian dictum that history does repeat itself, first as tragedy, then as farce—is a permanent part of the world lexicon. Churchillian phrases–“The awful ruin of Europe with all its vanished glories,” he said in 1946, “glares into our eyes”–can still summon a sense of ravage and loss, the melancholic epilogue to Britain’s finest hour. The six candid and thoughtful volumes of memoirs written by Macmillan, scion of the great publishing house—Rudyard Kipling, Margaret Thatcher’s favorite poet, and Thomas Hardy were among the writers whose affairs the young Macmillan personally handled for the firm—are a banquet compared to Mrs. Thatcher’s 900-page memo, with its flavorless, self-serving dollops of hash. Mrs. Thatcher covers only her Downing Street years, so she stands before us fully blown, the imperious eponym for an era and a political style even the British had seen enough of by 1990, though its effects persist. Every political memoir acquits its author, but Mrs. Thatcher’s auto-hagiography gushes with certainty. What, its subtext asks, makes a great prime minister? Watch me, it answers, as I tell you—a trick that can only work if the reader’s faith matches the author’s, and Maggie Thatcher’s belief in her own rectitude is, by her own admission, matchless. The lady’s not for turning. Only two prime ministers in Britain’s long history of parliamentary rule served longer than the Dame de Fer, a totally unexpected choice to lead the Opposition in the aftermath of PM Ted Heath’s fall from grace in 1975. First elected to Parliament in 1958 from a safely Tory constituency, Mrs. Thatcher moved from the shadow government into the cabinet when Heath’s Tories were returned to power in 1970, but she was little known outside the circle of Tory ministers. Hugo Young, whose sympathetically critical biography, The Iron Lady, published on the eve of her departure from power, is a useful adjunct to The Downing Street Years, argues that Thatcher’s very position on the margins of Tory power guaranteed her success. No Heath insider was prepared to stand against him. Mrs. Thatcher, known then and forevermore for hard work and extraordinary preparation but with no known affinity for political theory or innovative ideas nor blessed with the eloquence of her predecessors, plodded to the fore. Only in retrospect was she able to cloak her ascendancy in ideological colors, repudiating the despised “consensual” politics of Macmillan and Heath. She surveys her Downing Street years from behind the ramparts of Thatcherism, the British version of Ronald Reagan’s drive to liberate the free market from the government’s malevolent clutches. dons refused to confer an honorary degree. Her budget cuts in higher education, they contended, had decimated British academe. The scientists, in particular, voted against her. “If they do not wish to confer the honor,” she said, “I am the last person who would wish to receive it.” No mention of this slight is made in The Downing Street Years. Anthony Eden, Macmillan, Heath—these were the vile compromisers, the consensus builders. Mrs. Thatcher saw politics in terms of good and evil and was confident that good would triumph. 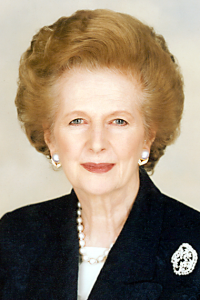 Mrs. Thatcher saw nothing inevitable about socialism, though as a political and economic scheme it had certainly been much further advanced in Britain than in the United States. 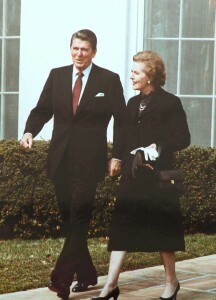 Both Reagan and Thatcher were deregulators, especially in the interests of Wall Street and the City of London, but Thatcher also broke the power or abolished the left-leaning municipal governing councils, and privatized the state’s great industrial enterprises-British Leyland, British Steel, British Airways and, not least, the collieries of the Coal Board. There were no American equivalents for these nationalized companies. She not only laid waste to Britain’s trade unions, whose “monopoly” she abhorred, she pulverized the Labor Party, who graced her governing years with astonishingly inept leadership. Another of her Tory predecessors as prime minister, Stanley Baldwin, once said, “There were three forces in conflict with which it was very unwise for a British politician to engage. These were the Vatican, the Treasury and the National Union of Miners.” Mrs. Thatcher confounded Baldwin’s dictum. She ignored the Vatican. Pope John Paul II, visiting Britain during the Falklands War but not wanting to alienate the Argentines, did not meet Mrs. Thatcher, the only foreign visit the Pope has ever made without meeting the local head of state. Mrs. Thatcher’s antipathy to the Civil Service in general—Whitehall, in British parlance—equipped her to bully the Treasury and impose her Friedmanite monetarist views on the British economy. In the long coal strike of 1984-85, Mrs. Thatcher thoroughly mastered the National Union of Miners, for whom she had only slightly less contempt than for the Irish Republican Army, who once came very near to assassinating her. One need not guess at her views on John Major’s talks with Sein Finn, the IRA’s political wing. Consensualism redivivus. To me consensus seems to be: the process of abandoning all beliefs, principles, values and policies in search of something in which no one believes, but to which no one objects; the process of avoiding the very issues that have to be solved, merely because you cannot get agreement on the way ahead. What great cause would have been fought and won under the banner, “I stand for consensus”? How about the Second World War? 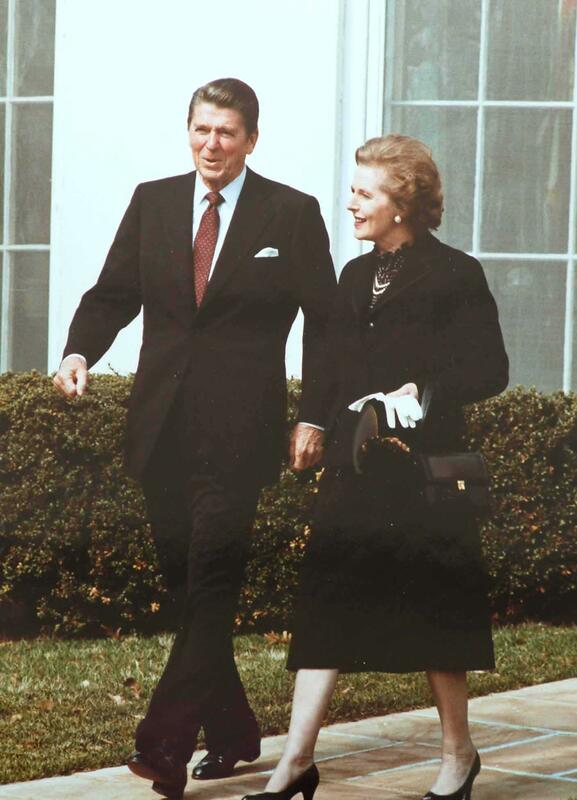 Would Lady Thatcher really contend that the United States, the Soviet Union and the British Empire had identically principled interests in that great struggle? Of course not. Her loathing of consensus is really an exhaustion with the notion of democracy, of the tedium of reconciling interests that sits at the heart of parliamentary governments. She preferred to rule, not lead. Her denunciation of consensus is sophistry, a veiled condemnation of anyone whose views she doesn’t like asking for a place at the table—the Irish, the West Indian, the Asian. Why did she refuse British passports to the citizens of Hong Kong? There was an official welcoming ceremony that began at Moscow Airport, where I was presented with a large bouquet of red roses which proved remarkably photogenic against my plain black coat and fox-fur hat.. .. I cannot deny that I enjoyed the splendor of these occasions, but I sometimes reflected that the traditional formalities were intended to clothe in the trappings of legitimacy regimes that had neither historical nor democratic credentials. There is no better guide to understanding Margaret Thatcher, in all her unctuous piety, than Stevens, who sees everywhere but into his own heart.